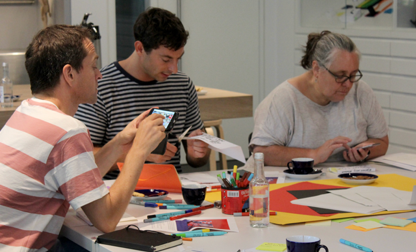 Last August, UAL Awarding Body hosted a successful Continuing Professional Development (CPD) event in partnership with the Design Museum. Alexandra Antonopoulou facilitated the event at the Design Museum and provides more information about the event below along with tips on how to make exhibitions a central medium to inspire contextual studies. Teaching Contextual and Theoretical studies (CTS) in Art and Design, we often come across students that may question the application of academic writing and theory in their future careers as art and design practitioners. In response, we, as academics, come up with methods that allow them to experience that the capability of forming critical arguments is not only part of designers, artists and communicators’ practice but also part of leading a sustainable everyday life. When encouraging students to read, research and write, it is often challenging to exclusively rely on classroom-based activities. In fact, alternative learning spaces such as museums and galleries can hugely contribute to CTS teaching and learning. The gallery allows both tutors and students to enter in an equal role, that of the visitor-learner, disrupting the conventional teacher-learner dynamics that are often assumed in a classroom setting. In this sense, the gallery becomes a free space that facilitates students to critique and speak up their minds. Deconstructing art while pretending to be an art critic, speed drawing, surrealist games and creative writing; they have all been fun ways to explore the body as a conductive medium of criticality and foster theoretical analysis during and after a gallery visit. Equally the gallery is a space that can inspire curriculum planning. The latest UAL awarding body CPD day at the ‘Hope to Nope’, the Design Museum’s fascinating political graphics exhibition, allowed the educators to think about their tutor personas, unpack the political nature of CTS and collectively come up with gallery-based briefs. What became apparent is that by considering the gallery as a political space offers plenty of opportunities to nurture curriculum development as well as students’ critical reflection skills.